Pizza stones have acquired quite a following among foodie cooks due to the results they often give; chewy yet soft crusts, that perfect brown hue and all-around even baking. However, buying a high heat pizza stone means you have to provide an additional effort to prepare it before usage. Like a cast iron pan, you have to season it first, with a max of two seasonings prior to use. For this you will need a pizza stone, your choice of edible oil (vegetable oil and olive oil are best) and an oven. First, you have to clean the stone with hot water without soap since the stone material is porous. This means the soap is capable of oozing right inside its pores and will affect how your pizza will taste. Now heat the oven to 450 Fahrenheit. In order for the oil to completely assimilate the stone, it needs to be hot first. In addition, the heat will produce a glossy sheen to the stone so the pizza won’t stick on it, especially the cheeses. Pat plenty of olive or vegetable oil onto the stone’s cooking surface, but not too generous that the oil will trickle all over its edges. Put the pizza stone in the warmed oven and bake the item until all the oil is absorbed by the stone completely. Open the oven and remove the stone. Let it cool down until you can touch it. Once again, rub oil on the stone and bake it yet again. After those two seasoning procedures are completed, the stone is ready for baking. But it is not seasoned just yet. Before baking pizzas, make sure that you have oiled its surface slightly with olive oil. Preparing it like this will help the stone in achieving a golden-brown hue. After its usage, make sure that you do not wash the item with soap. Just scrape any leftover sauce, crust or cheese off of the stone with a spatula made of plastic and wash it with hot water. The soap can still penetrate the stone and will give an unnecessary soapy taste to your pizza. If you are not satisfied with the whole hot-water-only method and want a deeper clean without using soap, you can try the baking soda method. 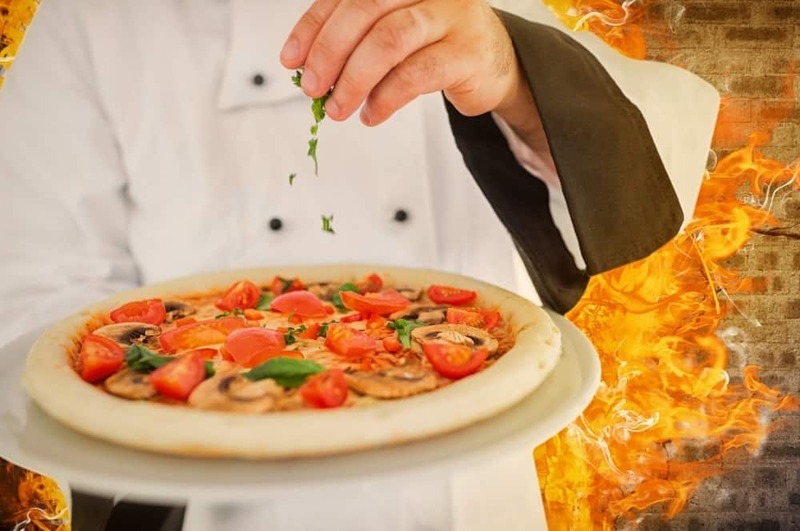 A sodium bicarbonate, baking soda is ideal for getting rid of excess grease and dirt, and it is also considered one of the safest cleaners to wash a pizza stone. It is a gentle abrasive and will not change the taste of the pizza. Firstl you have to mix balanced parts of hot water and baking soda in a container until it has achieved a paste-like texture, almost resembling toothpaste. Then, get rid of the bigger food remains using a plastic spatula. Make sure that you have removed all of those bigger pieces first before cleaning the stone completely. Take care handling the item because frequent handling increases its tendency to crack or break with time. Scrape the baking soda mixture into the stone with a stone brush or toothbrush. Create tiny round motions on the problematic parts and scrub away. Next, tackle the darker or discolored parts of the stone and then finish scrubbing the rest. In case the stone still has deep stains, you might have to go back to those stains after wiping the pizza stone. Polish the stone with a moist, clean cloth. As soon as you have wiped the stone, it now includes a layer of the baking soda solution on it. If you feel like you are not making any progress with the cleanup, you can rub the stone down with a moist cloth. Go back to the problematic areas of the item following the wiping procedure and do the scrubbing process all over again until the problem parts are gone or have turned shades lighter. Let the stone dry completely. If possible, wait a day before using the item. The remaining moisture can harm the stone and shorten its lifespan. Store the stone in room-temperature areas.